Location: Tubber, County Galway, in Ireland. Ownership / Access: Private. Maintained by the Office of Public Works. 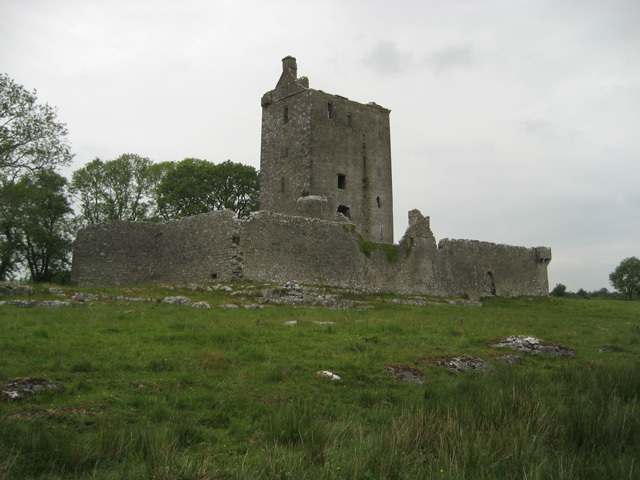 Notes: Fiddaun Castle is a tower house in Tubber, County Galway, in Ireland. Fiddaun is a mid-16th century Irish tower house in the Kiltartan barony of the Ui Fiachrach Aidhne, one of four O'Shaughnessy castles. This tower house is most noted for its well preserved inner bawn wall and situated between Lough Doo and Lough Aslaun near the modern village of Tubber. It is located on private land and maintained by the Office of Public Works. Fiddaun was most likely built by Sir Roger Gilla Dubh O Seachnasaigh, as he is the first mentioned living there and it is not known before his time.